Lance Binoniemi, executive director of the Michigan Licensed Beverage Association, said 75 percent of 450 member bars and restaurants surveyed statewide reported a dip in profits in May, June and July, compared with the same period in 2009. The group has about 2,500 members overall. Most respondents attributed the sales decline to customers who pack up their smokes and go elsewhere, Binoniemi said. 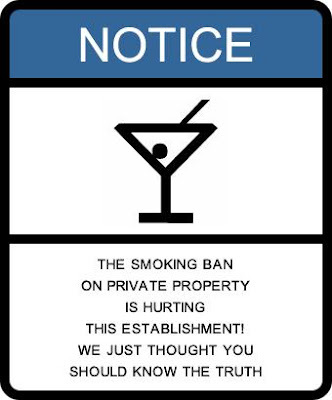 The association surveyed the businesses in August following the smoking ban affecting restaurants, bars and workplaces. Here in Minnesota we already knew that the smoking ban lobbyists, who were funded $446+ million by Nicoderm interests at RWJF, lied to lawmakers and the public when they claimed smoking bans were good for business......as we've already seen approximately 450 MN bars & restaurants close since smoking bans were enacted in the land of 10,000 unemployed hospitality workers. And a reminder to the newly elected Republican majorities out there......Republicans stand for free market choices and property rights.......NOT smoking bans. And when you understand that smoking ban lobbyists are funded by alternative pharmaceutical nicotine interests, and smoking bans negatively impact economies, the message is clear........smoking ban lobbyists are NOT TRUSTWORTHY but rather paid spokespersons for the Nicoderm, Nicorette, Nicotrol, Commit, drug companies......don't give these activists (once reputable, charitable organizations ALA, ACS, AMA, CTFK, etc.) the rent seeking time of day, they lost the title "reputable" once they provided false testimony about secondhand smoke in exchange for multi-million dollar funding from Nicoderm, Nicorette interests at the Robert Wood Johnson Foundation (RWJF). Netherlands reverses their 2 year old smoking ban after owners complain of "plummeting profits"
The new Dutch government has scrapped a smoking ban for small bars and cafes, reversing a public health measure introduced two years ago by the previous administration. Health Minister Edith Schippers said Wednesday in a letter to parliament the move "gives consumers more choice". Small cafe owners complained bitterly after the ban became official in July 2008, saying it sent their profits plummeting. Schippers said the government will lift the ban immediately. Referred Law 12 is another special interest attempt to strip away freedoms from South Dakotans........vote NO. As a resident of Minnesota the smoking ban has destroyed businesses (closing 420+ bars & restaurants), and eliminated approximately 15,000 jobs here. New report from Minnesota Auditor's Office proves REVENUES DECREASED by an average of 31.9% in bar and tavern businesses after smoking bans were enacted. Update: Find election results by precinct online here.